One of a pair of FR Aviation BAC TSR.2's, 'G-FRAF' celebrated 40 years of active flying last year, having rolled off BAC's production line way back in 1969. Initially completing ten years service as serial number 'XS986', with 237 Operational Conversion Unit at RAF Wyton, this was then followed by a move to the Royal Aircraft Establishment at Farnborough. After a relatively brief period of conventional trials work, including delivery of supersonic targets over the ranges in the north and west of the UK she, along with several other surplus TSR.2's, eventually found themselves languishing outdoors at Hurn Airport (now Bournemouth International), after the 'Target Drone Controller Aircraft' project was canceled in 1983. Fortuitously, Hurn-based Flight Refuelling Aviation (FRA), now known as FR Aviation and part of the Cobham Group, were looking to increase the size of their air warfare training fleet. 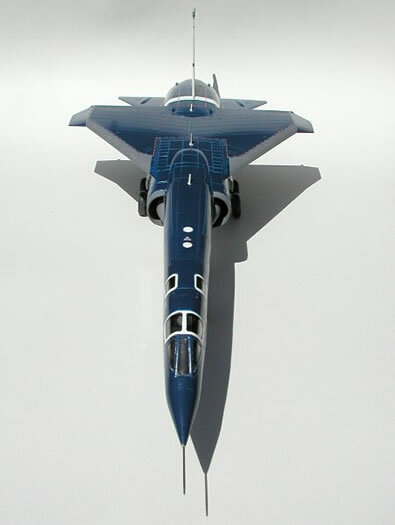 Already operating the Dassault 'Falcon' 20 in the role, the TSR.2's greater payload capability, performance, twin cockpits and ready availability, made the aircraft an ideal choice. 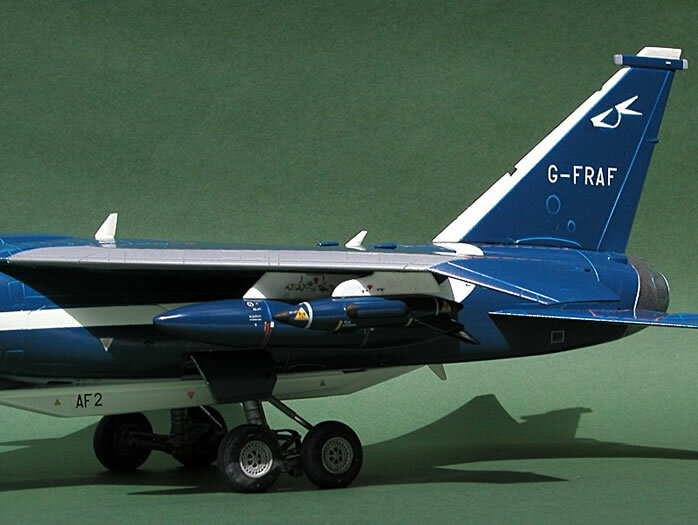 Eventually, FR Aviation completed the conversion of two TSR.2's, both aircraft rolling out in 1987 having been registered as 'G-FRAF' and 'G-FRAE' respectively, in recognition of their time with both former operators. Despite advancing years, Cobham's TSR.2's seem set to carry on giving sterling service for the foreseeable future, long after the last of the RAF's GR.1's and GR.4's have been retired. In the meantime, they continue to grace the skies over Bournemouth and the South of England, helping to provide a vital training service to both UK and NATO forces. Given the pace of my modeling, this 'what-if' kit has taken some 16 months to complete. Originally, I had intended to do a full-blown build article, but the length of time involved in both construction and finishing, has taken the edge off my enthusiasm somewhat, so this simpler 'feature' article will have to suffice I'm afraid. Nosewheel gear modified with plasticard, scrap material and fuse wire to represent the nosewheel steering actuator and associated hydraulic lines. Main gear - added fine plastic rod to each gear leg, to represent the solid hydraulic lines, as well as using electrical fuse wire for the flexible hoses at the rear of the scissor links. Also included a outer pivot point, on the upper part of each leg, to receive the additional (and also modified) hydraulic strut present on the sprue, but not shown in the instructions, which links to the rear of each bogie unit. Given the 'What-If' nature of the project, the accuracy or otherwise of the kit's cockpit was relatively unimportant. No apologies here - I used David Francis' idea from his 1:48 Airfix TSR.2 test shot build-up article (January 2009 issue of 'Scale Aviation Modeller'), by utilising the Eduard pre-painted etched cockpit set, designed for the North American 'Vigilante'. Added some conventional instrument panels to the side walls (which were otherwise bare) from the spares box. Ejection seats - used the kit's seats as supplied, but fitted with 'between the leg' ejection pull cords, modified from the twin-loop Vigilante ones on the Eduard fret. Gave up trying to tint the twin canopies and opted for a clear finish (excused as a later, cost-saving, production modification!). The canopies on mine are also loose items I'm afraid - Blue Tack was used to hold them open for display/photography! Used brass rod, in both fin and tailplanes, to ensure a secure attachment to the fuselage. 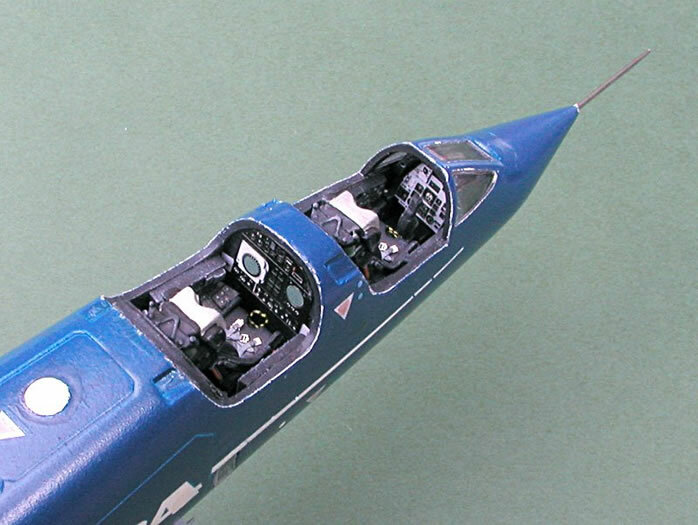 Nose cone pitot tube, is a cut-off sewing needle, rather than the plastic item in the kit. Aerial across the top of the fin/rudder, is taken from the Airfix Jaguar GR.1 kit - almost an exact fit and no loss to the kit I have, as that one is intended to be a T.2A (which does not need it). Opened up, boxed-in and glazed the oblique camera windows on either side of the fuselage, just behind the rear cockpit (no camera or other instrumentation fitted though). Used one of the two test cameras supplied (originally intended to be mounted on the side of the engine intakes) and mounted it under the forward cockpit floor, facing forwards. Might be a another camera, or perhaps some type of optical sensor, who knows? Ideally, for the air warfare training role, there should be four ALQ-167 jammer/threat simulation pods of various configurations under the wings, but since these would need scratch-building (not that I don't have these on my 'To Do' list, you understand), I opted for the expedient approach of using existing stores from the spares box. 2500 litre drop tanks, Boz Pod and Sky Shadow pod (and their respective pylons), came from a scrapped Airfix Tornado GR4/GR4A kit. Both the latter stores are actually prototypical for FRA aircraft, albeit only on their 'Flight Trials' aircraft. Ventral reconnaissance pod (used here as an interchangeable mission systems pod), is the Cammett resin offering. This unit is actually a good push fit into the bomb bay, so in theory could be removed and replaced with closed bomb bay doors if required. The various antennas evident are either ex-Airfix Buccaneer kit, or modified fins from missiles (Sparrow?) from the spares box. On a 'What-If' model like this, you can't have too many of such things. The white base colour, is the much vaunted 'Appliance White' from a rattle can, designed (perhaps not surprisingly) for use on 'white goods' such as fridges, washing machines (i.e. as the only finish and on largely flat surfaces). Whilst it is certainly very white, I wish I had not used it, as it has a very hard and brittle skin when dry, and so does not work well when applied over masking (e.g. causes ragged edges when masking removed). The overall 'FRA' blue colour, which hasn't reproduced well in any of my photos, is of my mixing, i.e. 5 parts Humbrol #15 [Midnight Blue] + 2 parts Humbrol #14 [French Blue] + 1 part Humbrol #25 [Matt Blue]. This was chosen after a great deal of experimentation, though I'm still not sure it is correct even now, as it is really difficult to assess the true colour, whether from internet references or when stood next to the real Dassault 20's! The Grey (wing leading edges and engine intake lips) is ordinary Grey automotive primer (rattle can again), as it seemed a reasonable match for the actual aircraft's colour in these locations. The prominent, dotted, 'No Walk' area lines on the upper wing, fuselage and tailplanes, are in my interpretation of 'Pale Roundel Red', i.e. 8 parts Humbrol #35 [Flesh] + 1 part Humbrol #153 [Roundel Red']. These were applied 'old school', using either a draughtsman's ruling pen or via spring bows (compass). Decals were a mixture of the kit's own (but only where they could be seen against the dark blue finish) and from the spares box. Those for the drop tanks, Boz Pod and Sky Shadow pod (and their respective pylons), naturally came from the Tornado kit's sheet. 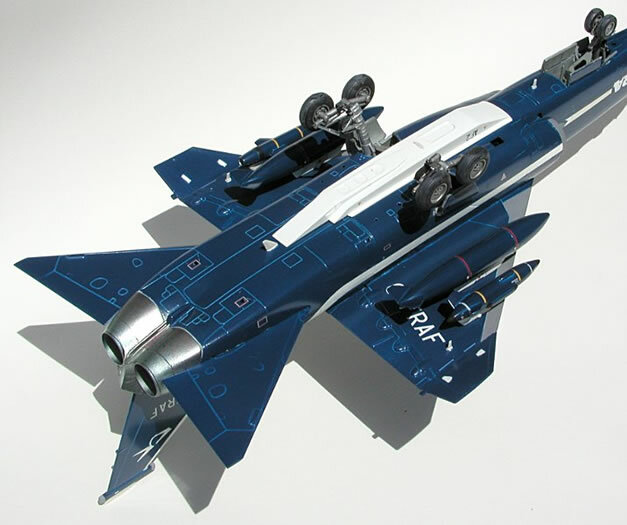 One or two decals were used from the Model Alliance sheet for the RAF Eurofighter Typhoon T1. The 'FRA' logo and the tail fin 'Twin Linked Speedbirds' logo (symbolic of in-flight refueling), were scaled from both online photos and from my own photos taken at previous Yeovilton Air Days and then drawn up using CAD. Their outlines were then printed out, at 1:48 scale, onto conventional white printer labels, carefully cut out with a scalpel and then used as masks over the white base colour. The white cheat-line was also masked, cut from a large sheet of 'Friskit-like' material I had been gifted some time ago (thanks go to Lee Coll), following many trials with paper versions first, to get the right size and shape. 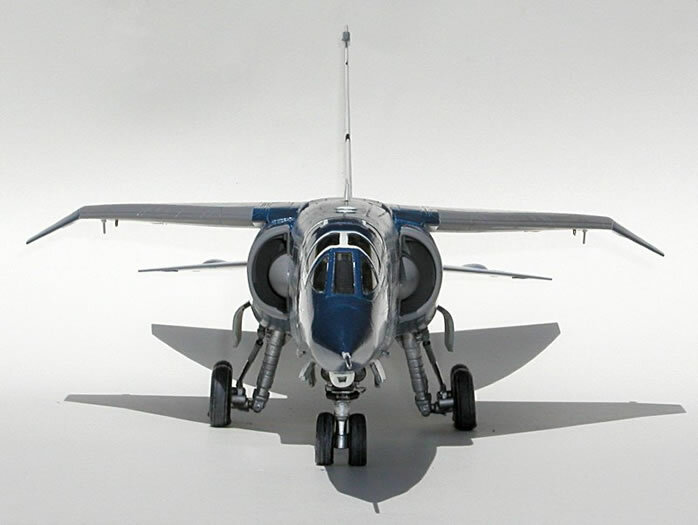 The Airfix 1:48 TSR.2 is quite a kit and although it has its faults (what kit doesn't? ), it still builds into an impressive and sizable(!) model which I did enjoy making, despite this being the longest period over which I have ever built a kit. That said, I hope you find it interesting and perhaps a little different to the many white prototype versions out there. Would I build another one? Well probably not for a good while, but I do have another kit in the stash and yes, it will be another 'What-If' - just not next week! Finally, some thanks. Firstly, I'd like to thank those on Hyperscale who have either taken the trouble to answer questions during this build or provided encouragement along the way. Also, I'd like to thank the FRA staff/aircrew who were at the FRA stand/display area, along with Dassault 'Falcon' 20 'G-FRAP', at the 2009 Yeovilton International Air Day. Their enthusiasm and patience, answering questions and providing superb photographic access, was much appreciated.